Autobloggreen has a post on the New York State Senate bill that would require car dealers to describe fuel efficiency as "gallons per 1,000 miles". The post has prompted the familiar call for using the metric system (see this post on the connection between "GPM" and the metric system) and the familiar lament that people should understand the math. Another wasteful bill. What is the purpose? You don't think people understand that if they buy a car that gets 25 mpg vs 20 mpg they will be using less fuel? As a native New Yorker I am embarrassed by the (lack of) quality of the states politicians. Yes, higher MPG is better than lower MPG, and people recognize this. But people use the difference in MPG as the rough approximation of gas savings, which is misleading--often in a big way. Instead of subtracting MPG, car buyers need to first divide a given distance by each car's MPG, and then subtract. (See the last half of this post on the math.) That's what GPM does without effort--a standardized GPM measure can be subtracted to know actual gas savings. Option A saves 11 gallons per 1000 miles; Option B saves 17 gallons per 1000 miles. The New York bill is designed to highlight the gas savings available to people who are driving or considering cars in the teens. This is where the biggest savings are possible. In fact, GPM may be most effective at keeping people who are currently driving more efficient cars from opting for less efficient ones. 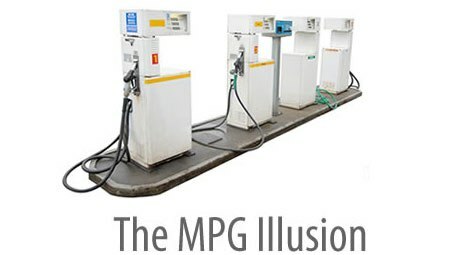 MPG tempts us to think that there is little harm in trading in a 20 MPG minivan for a 15 MPG SUV. What's 5 MPG? GPM makes clear the impact.